Our Most Popular Selling Grade Rod, the Seco SVR Surveyors Series Grade Rod. The Seco Surveyors SVR Series is a very popular and well-built Fiberglass Surveying Grade / Level Rod, and is a recommended product by the EngineerSupply Product Team. We have not seen a higher quality or tougher grade rod than the Crain SVR Series. The Seco SVR Series Leveling/Grade Rod, or Story Pole, incorporates many versatile design advantages not found in other leveling rods. The SVR Series features a newly redesigned locking mechanism that is tight and accurate, an unique shape, a special measuring scale, compatibility with laser levels and EDM systems. The SVR has a rectangular-oval shape, and flat on the front and back with round corners. This convenient shape prevents the scale from rolling, making observation much easier, and is easy on the hands. The rod is also water-proof, corrosion-resistant, and non-conductive. In addition to being a leveling rod on the front, the SVR rod has a measuring scale on the back (with the exception of the dual-scaled rods) that allow the user to read overall height measurements at eye level, which is useful in making clearance and height measurements. 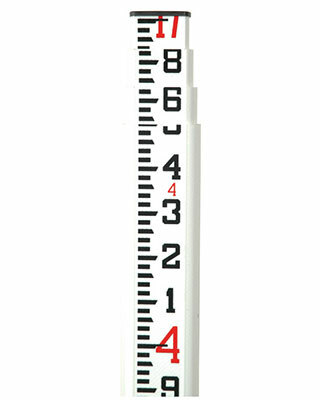 Also on the back-side with the measuring scale, there are alternate 1' red and white markings that are suitable for stadia purposes. The newly redesigned locking mechanism now features round buttons. Tight and accurate, the lock is specifically designed to resist jamming from sand and dirt. Simply press the lock buttons and pull the sections out. To further disassemble, a Phillips screwdriver is needed (screwdriver sold separately). The locking mechanism is tight and accurate, yet designed to resist jamming from sand and dirt. The lock features round buttons. The individual sections are numbered for identification and sections and repair parts are available. Sturdy Nylon Carrying Case Included (includes carrying handle and shoulder strap). The SVR Level Rod is available in two lengths, a 17-foot version or a 25-foot version, as well as Metric Versions. Includes: Crain SVR Series Fiberglass Grade Rod, Nylon Carrying Case with Carrying Handle and Shoulder Strap, and One-Year Manufacturers Warranty. Best grade rod on the market! Will buy again soon. Fiberglass is a bit heavier than the aluminum rod we have but i like the way it feels and it should last longer than aluminum. I'm rating 4 stars only because I wasnt expecting it to be heavier than the rods I've owned in the past but its thick fiberglass and very tough feeling so maybe I'll come back and do 5 stars after using the rod. I got this rod for my landscaping and grading business. We dig basements and footers, grade ditches, install drain lines and do landscaping among other things and a grade rod is invaluable to what we do for a living. I almost was thinking buy a cheaper aluminum rod like I have in the past but tried this SVR fiberglass rod and am very glad I did. It will outlast 3 or 4 of the aluminum rods that I have gone through. I ordered by phone and Engineer Supplys customer help folks are helpful and friendly. At this price I will be buying another one next month. Very satisfied with product and service. I received my order just fine, no damage. Upon opening the box I realized this was a professional tool and not junk. I have never owned a fiberglass grade rod before as all of mine in the past were aluminum. This rod feels like something the moment you start using it. I think long term it'll outlast the aluminum rods simply due to the way the numbers and graduations are made into the rod. I don't see how they'll rub off like they did on our aluminum grade rods. The test will be our guys using these in the field so will know more in a few months. Garrett P.